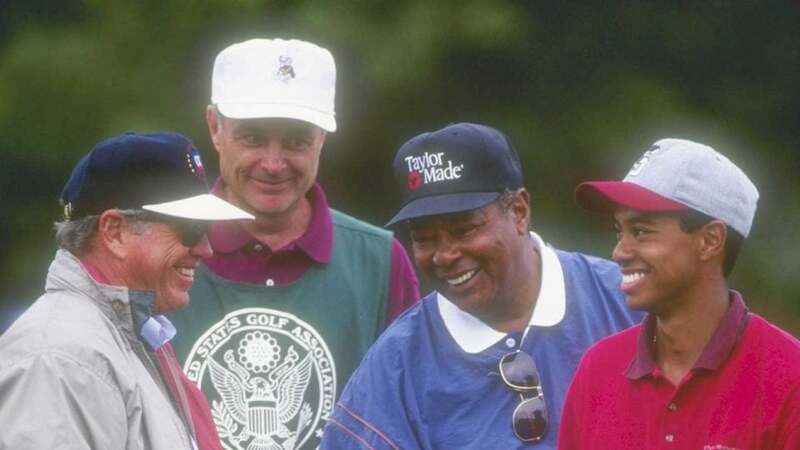 Jay Brunza, second from the left, played a key role in Tiger Woods's success as an amateur. LA JOLLA, Calif. — Charlie Howell is good at golf and also golf trivia, so you can imagine his frustration when he struggled with a I-should-get-this question shortly after signing for a Thursday 66 here at Torrey Pines: What former Tiger Woods caddie was walking the course today outside the ropes? “Can’t be Steve Williams,” Howell said. “I don’t think it’s Fluff.” Howell tilted his head before gasping, “I don’t think I’m gonna get this.” “Jay Brunza.” “Jay Brunza! I should have gotten that,” Howell said. “I worked with Jay.” Dr. Jay Brunza, a 75-year-old clinical psychologist and retired Navy officer, should probably be in the Caddie Hall of Fame, based on his work as Woods’s caddie as an amateur. Brunza came to carrying the bag because he was Woods’s mental coach, but he was right there beside the kid phenom when he won two of his three USGA boy’s titles and all three of his USGA men’s amateur titles. He also caddied for Woods when Woods played in one U.S. Open and two Masters as an amateur. Along with Earl Woods (Tiger’s father) and Butch Harmon (Tiger’s swing coach), Brunza was an integral member of Team Tiger in its pre-Nike years. All three men were shaped immeasurably by their military service and their life lessons became Tiger’s life lessons. In his prime, Woods displayed Harmon’s macho strutting, Earl’s us-against-them mentality and Brunza’s cerebral self-analysis. Brunza, who grew up in a Pennsylvania coal-mining town near Wilkes-Barre, has lived in Southern California for most of his adult life and is still active as a golf psychologist, though one with a decidedly modest profile. He does not write books or magazine columns. You seldom see him quoted and he has never discussed his work with Woods in detail. When Woods first turned pro in 1996, there were Tour players and caddies whispering about Brunza and Woods and their use of hypnosis. “I tried it with him,” CH3 said on Thursday. Howell described sessions in which Brunza held a shiny metal ball on a chain in front of his patient’s eyes, as it went back and forth “like a metronome,” Howell said. “I was too Type A to ever fall into a trance. But I liked him. He’s a great guy.” Howell worked with Brunza for about a year, and he can see Brunza’s influence on Woods every time Woods closes his eyes for a long, still second or two before playing a shot. That moment is often the calm before the storm. Tiger Woods shot a 2-under 70 during his first round at Torrey Pines Thursday. Since Woods’s last major win, at the 2008 U.S. Open at Torrey Pines, analysis of Tiger’s changing swing and balky body parts have dominated the coverage of his golfing life. That’s surely how Woods prefers it. But Woods would never have been able to resume his place among the world’s best golfers, following his April 2017 spinal-fusion surgery and May 2017 roadside arrest, without a world-class mental game, too. Whatever Brunza gave Woods years ago surely survives today. Woods was Brunza’s first prominent golf patient. Today, he works with different college golf teams on a consulting basis, including the University of Texas. That’s how he got to know Dylan Frittelli, the 28-year-old South African golfer of Italian descent who plays on the PGA Tour. Frittelli was on the Longhorns team that won the NCAA Championship in 2012, as was Jordan Spieth. On Thursday, on the North Course at Torrey Pines, Spieth, along with Justin Rose and Billy Horschel, went off at 9:40 a.m., local time. Hundreds of spectators followed them. Frittelli, with Jim Knous and John Chin, played in the next group. A dozen or so people followed them, Jay Brunza among them. Brunza has been helping Frittelli for about eight years. He is staying with Brunza this week. On Thursday, Brunza walked with Ryan Donovan, a friend and the head coach of the San Diego State men’s golf team. Nothing about Brunza’s manner or appearance hinted at the remarkable history he has with one of the most accomplished athletes ever. He was wearing running shoes, baggy dungarees, a maroon sweater with a Callaway logo that you would not describe at the height of fashion. He made no effort to avoid eye contact with Frittelli, and he was rooting for his success with a certain restrained passion. He and the golfer are close. Answering questions from a reporter, Brunza was neither voluble nor circumspect. He was appropriate. He readily identified the various fighter jets that flew over the course. Dylan Frittelli is the 83rd-ranked player in the world.